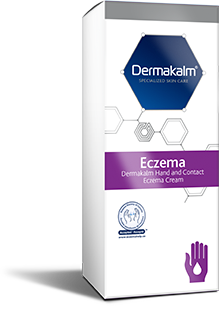 Dermakalm Hand and Contact Eczema Cream (100 g/3.5 oz) is specially formulated to help provide temporary relief of symptoms of hand and contact eczema (dermatitis), such as itching, red spots, dry skin, scaling, oozing, abrasions and hardening of the skin. It provides temporary relief of irritation and is recommended for patients with irritant or allergic contact eczema (dermatitis). 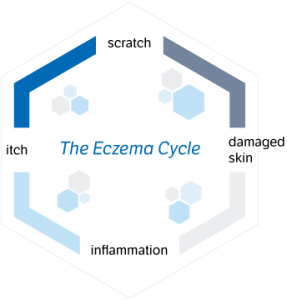 Developed with dermatologists, Dermakalm Hand and Contact Eczema Cream helps provide temporary relief of symptoms of hand and contact eczema (dermatitis). Free of corticosteroids, fragrances, parabens and artificial colouring. Adults: Apply a thin layer of Dermakalm Hand and Contact Eczema Cream to the affected area 2–3 times per day. Repeat the application if the affected area has been washed or cleaned. For use beyond 4 months of time, consult a healthcare practitioner. Medicinal Ingredient: Aluminum Silicate 3.85%. Non-Medicinal Ingredients: Aqua, Benzyl Alcohol, Ceramide 1, Ceramide 3, Ceramide 3b, Ceramide 6 Ii, Carbomer, Ceteareth-12, Ceteareth-20, Cetearyl Alcohol, Cetyl Alcohol, Cetyl Palmitate, Cholesterol, Cocoglycerides, Dehydroacetic Acid, Ethylhexylglycerin, Glycerol, Isopropyl Myristate, Glyceryl Stearate, Magnesium Chloride, Sodium Lauroyl Lactylate, Phenoxyethanol, Phytosphingosine And Xanthan Gum.